Weather officials say the rain has stopped in a small West Texas city where four people went missing after floodwaters overran a recreational vehicle park. Authorities resumed searching at daybreak Tuesday. The four people went missing after heavy rains caused the South Llano River to in Junction, about 140 miles (225 kilometers) west of Austin. Meteorologists say more than 12 inches (30 centimeters) of rain has fallen in the area since Sunday. National Weather Service meteorologist Mike Decker says cloudy and rainy conditions in the area Tuesday morning gave way to clear skies by afternoon. He said the next chance of rain in the area will be on Friday. An official says swift-water boats are patrolling a 35-mile stretch of river for four people who went missing after floodwaters overran a recreational vehicle park in a small West Texas city. Texas Game Warden Rachel Kellner said Tuesday afternoon that the boats were patrolling a stretch downstream from the RV park located on the South Llano River in Junction, a city about 140 miles (225 kilometers) west of Austin. She said the boats would be slowly going down the river, as crews hoped to hear anyone who might be in a tree or on a riverbank. Kellner said an unmanned drone was also on its way to be used in the search. The search has resumed for four people missing after a West Texas RV park was overrun by raging floodwaters. Texas Game Warden Rachel Kellner says the search resumed Tuesday morning with crews walking the banks of the South Llano River downstream from Junction, Texas, and a few boats going in. She says it is very windy and that the river is rising again, with more rain expected. She says the current is too strong for some boats to get into the river and because of the weather conditions, no helicopters can get into the air. Kellner says the four missing are one woman and three men. Earlier, officials said all four are men. Emergency personnel in helicopters and boats rescued 19 people Monday in Junction, a small city about 140 miles (225 kilometers) west of Austin. Four men remain missing after a West Texas RV park was overrun by raging floodwaters and authorities are awaiting daybreak to resume their search. Texas Game Warden Rachel Kellner said early Tuesday that the South Llano River at Junction is a “muddy mess,” full of debris and too dangerous to search until after sunrise. Kellner says the men are co-workers whose recreational vehicle was among several swept away in the floods after heavy rain late Sunday. 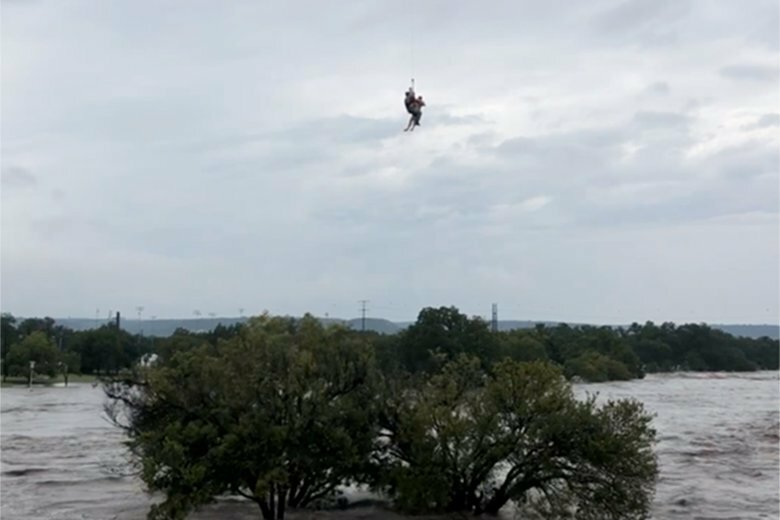 Emergency personnel in helicopters and boats rescued 19 people Monday in the small city about 140 miles (225 kilometers) west of Austin. Kellner says she knows of no one else still missing. She says all those rescued Monday were checked out by medical emergency personnel. She doesn’t know if any of them required hospitalization.